In a bowl cook 1 cup of Penne Pasta in 3 cups of water. Add 1 tsp of salt to it. Let it cook for about 10 mins or more. Heat 2 tbsp butter in a pan. Once its hot, add corn flour and stir it. Keep on stirring so that it forms no clumps till it changes slight yellow. Then add 1/2 cup milk and stir again. Add 1/2 cup fresh cream and stir. Then add mozzarella cheese. Mix it . Add chicken pieces , pepper powder and salt to taste. 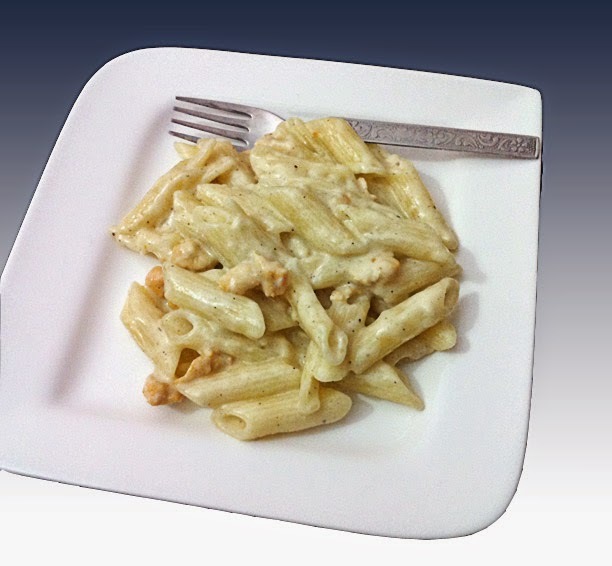 Now Strain the Penne pasta and mix it in White sauce. Serve hot. You can also keep cooked pasta and sauce separately and mix and serve when needed.